It’s 1994 and you’ve been given the task to promote a pair of shoes specifically designed for golf players. This new shoe model is simply amazing. It will help golfers improve their performance. You, the talented marketer, decide to promote these golf shoes with some ads on TV, on the radio, on billboards and in newspapers. You even thought about hiring a celebrity to endorse them. These tactics will help you get exposure and sell more shoes but the problem is, you’re advertising to everyone and it’s going to cost you a lot of money. You then decide to advertise in Golf magazines and even sponsor golf events since that’s where your audience is paying attention. These tactics improve your targeting by helping you get your shoes in front of your ideal customer – golf players. Since you’re an experienced digital marketer, you decide to leverage some digital marketing channels. You promote those shoes on Social Media – Facebook, Instagram.. In today’s age, digital marketers have endless options when it comes to advertising their products. What’s important is to understand how each digital channel works and how it can help you achieve your marketing goals. Nowadays, you hear a lot about digital marketing. Why? Mainly because there’s a lot going on in this industry. Things are changing very fast. We’re getting distracted from every angle. Technology is evolving. Consumer behaviours are shifting by the minute. What’s popular today might not be next month. All of this is creating a big challenge for eCommerce businesses and their digital marketers. How do you keep up with everything? In this article, I want to explain what digital marketing is and help you get familiar with the different digital marketing channels that you should be focusing on in your online strategy. First, What Is The Meaning of Marketing? Let me ask you this question: Why would John buy an expensive Rolex watch? Maybe that’s what he wanted after he saw a Rolex ad while watching a Tennis match on Youtube. He’s a real estate agent who believes his image has a big impact on his success in selling luxury homes. A Rolex watch is valuable to him because it communicates luxury and helps him attract the right clientele. Marketing is all about satisfying the needs and wants of the target consumer. It’s how we research, promote and tell stories that communicate value with the end goal of positively influencing sales by selling our product to them. Next, What Is Digital Marketing? Digital marketing is a subset of marketing that is used to promote a brand or product using one or more electronic technologies. The goal is to influence target consumers in taking action. The power of digital marketing is phenomenal. You can reach millions of users within hours and a couple of clicks. Now that’s true power available to anyone. Keep in mind, the Internet is one of those electronic technologies (online). You also have some (offline) technologies that you may consider such as text messaging, electronic billboards, mobile apps, digital TV and podcasts. You know what’s exciting about digital marketing? Every year, there are new technologies being introduced. Some of them fail, while others succeed and they become part of our digital marketing strategies. 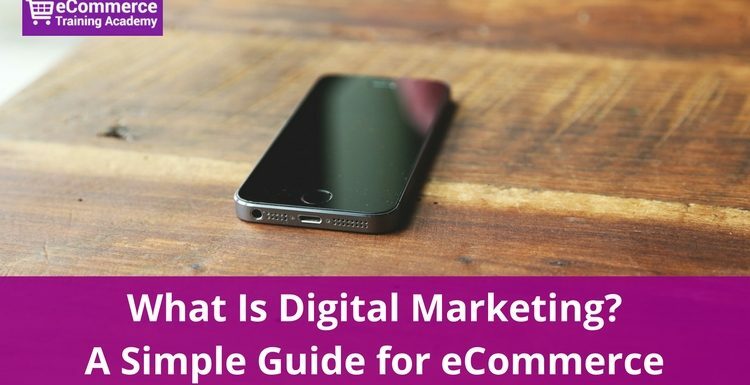 Why Is Digital Marketing So Important for eCommerce Businesses? Remember the day when Steve Jobs introduced the first iPhone? I truly believe that’s when Digital Marketing became a lot more challenging – and fun! Users are no longer consuming content while sitting. They’re now doing it on the go or while multi-tasking. Overall, we’re missing a lot of things because we are constantly staring down at our phones. We’re being distracted with notifications and even phone batteries are having a hard time keeping up with our usage. All of this is creating a big challenge for eCommerce businesses of all sizes around the world. How do you get the attention of the distracted prospect? We’re no longer watching TV the same way we used to. It’s now been replaced by Youtube or Netflix. We’re no longer listening to the radio like we used to. It’s now been replaced by podcasts or Spotify. We’re no longer reading newspapers like we used to. It’s now been replaced by emails, apps & websites. We’re no longer paying attention to giant billboards like we used to. It’s now been replaced by a small screen in our hand. That’s where digital marketing comes into play. The only way to reach prospects these days and be able to market your products is by utilizing the different digital marketing channels. One thing in common among all successful eCommerce stores is how they incorporate all these channels within their marketing strategy. They’re not simply focusing on one and ignoring the others. Leveraging all of them is what makes them succeed. According to PowerReviews, 35% of consumers start their shopping journey on Google search. Making sure your eCommerce store is optimized for search engines is key. Both onsite & offsite SEO efforts must be put in place and constantly tweaked as search algorithms are changing. Moz.com is a great place to start learning about all things SEO. If you’re looking for immediate short-term results and you simply can’t wait for search engines to rank you (it usually takes 3-6 months to see significant traffic from SEO), SEM or paid search (PPC) is the perfect channel. Google Adwords is a great way to target search queries on Google.com and it’s among the leading paid search channels retailers should be focusing on. Wordstream is a great blog for PPC content. Email is not dead. We’re simply using it differently. It’s still one of the most effective digital marketing channels for retailers delivering positive ROI. Emails play a huge role in the customer shopping experience. Users might email questions about products or general information requests about your company. You send out digital invoices by email. You remind customers of their abandoned shopping cart and so much more. While triggered emails can certainly help you boost sales, scheduled email campaigns can you help you communicate with shoppers value and promotions. As an online retailer, you can’t just be focusing on selling. You need to provide value without requiring customers to make a purchase. That’s where content marketing comes to play. One of the best ways to nurture and delight customers is to create valuable content that helps them solve their daily challenges. Whether it’s a simple buying guide or short blog post explaining how to cook something, creating this type of content will help you build awareness, nurture your prospects and delight current customers. Hubspot is the leader in content marketing. Social media networks are here to stay and they’re consuming most of the user’s attention. Posting regularly on Facebook or Instagram is only part of the solution. Digital marketing professionals must include paid social media as part of their strategy since social networks are making it harder to reach your audience without paying. Social Media Examiner is a great blog to help you stay on top of the social media world. Banner ads are no longer as effective as they used to be but nonetheless, if planned right, it can have a positive impact. Internet users are developing habits of ignoring banners ads on websites unless your ad has the right message. Retargeting might be considered invasive but if done right, it can truly help eCommerce stores convert shoppers into actual customers. New technologies allow retailers to dynamically target website visitors with specific products or content they might be interested in. Let’s face it. The internet browser is no longer the only software used to access the web. We’re now using apps more than ever. Just look at how many apps you’re using when socializing with friends. Having a mobile strategy is important more than ever. Users behave differently on smartphone and digital marketers need to be there at the right time with the right message. Traditional marketing is not dead but it’s no longer having the same impact as it used to have. Prospects are now glued to their smartphones and are constantly being distracted Their attention span is limited. As a digital marketing professional, your goal is to find ways of grabbing that limited attention by communicating stories that resonate with your target audience. You need them to take action at the right time and purchase your valuable product. Keep in mind that there will be new digital marketing channels popping up in the future. Before you jump on these new channels, make sure you have the ones I mentioned above under control. What is your favourite digital marketing channel and why? #10 Post Purchase Marketing. Continue a branded digital conversation while she is tracking her order. Don’t hand that conversation off to a carrier. Do the same if she wants to return something. I think it’s so interesting how beneficial eCommerce can be for a business! It seems like anyone who wants to sell something would want to try it. People use the internet more than they do TV nowadays, anyway. Social media marketing is definitely consuming a lot of people’s attention. The “marketplace” is definitely pushing people to begin purchasing things online. Great information. Thanks for bringing my attention to Social Media examiner. Glad you enjoyed it! Thank you for the support! in today’s world if you want to make a online store successful then the online digital marketing is necessary. Indeed it is Jeff! Thanks for reading. 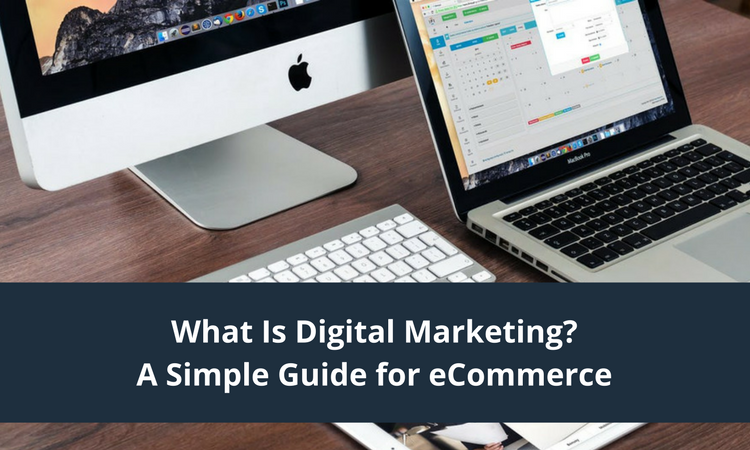 I can definitely see why digital marketing is so important for eCommerce. Like you said, people are on their phone a lot more than they’re looking around at advertisements. So, getting that online presence would make a huge deal, I think. Precisely! Great thoughts! Very well-explained, easy to take note. Thanks. The very good article, keep continuing to update this kind of article.I want more information about this topic.